Okay, lets talk voyeurism in the guise of Route 66 travel blogs and sites. One of my favorites, listed below in the section for favorite blogs, is that of Laurel Kane who chronicles the adventures of a Route 66 business owner. Laurel is the owner and proprietor of Afton Station, in the faded old town of Afton, Oklahoma. This former DX station, with its cast of colorful characters that often frequent the place, exemplifies the modern era on Route 66 while preserving the spirit, the essence of what made this highway truly unique. Vintage cars, with the emphasis on vehicles manufactured by Packard, are but one reason to make a pit stop here. The eclectic collection of Route 66 and Afton memorabilia is another. Route 66 is like a long string of mismatched diamonds, rubies, and precious stones. Some are polished, some are pretty rough around the edges, some are so dusty it is hard to see the sheen but each and every one of them is a gem. Afton Station is but one of them. On our trip last October, I had the opportunity and pleasure of introducing my dearest friend to a few of them. It also provided the opportunity to discover a few others, something that shows just how amazing this old road is. I have been following its twisted course from east to west and west to east for about a half century and yet there are still treasures awaiting discovery. Some were simply overlooked, others didn’t exist on our last trip, and others have been carefully polished. 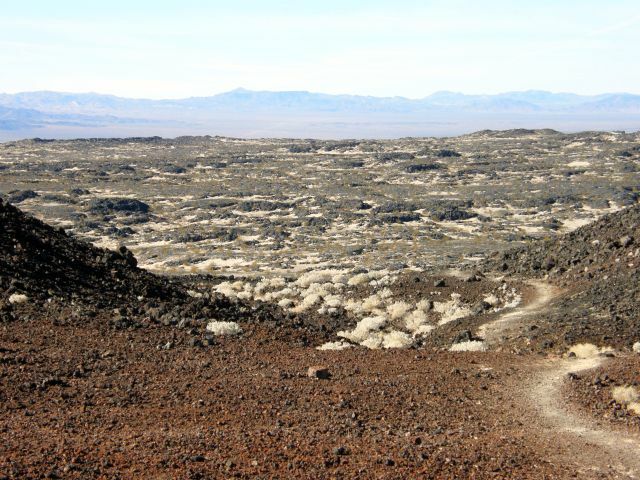 We kicked off a new year of adventures on Route 66 with a trip to Amboy, and the climbing of Amboy Crater, on the second of January. As the calendar fills, and we balance the call of the road, the obligations of the day job that supports the writing habit, and the urge to see old friends on the road, and make new ones, this trip seems more, and more symbolic for the year 2012. A first glance it likes a long drive across a big empty followed by a long, dusty, tiring walk through an even bigger empty. But as the anticipation builds, and the trip begins, the grand adventure unfolds and soon the cares, worries, and stresses of the day are rolled back with the passing of each mile. Standing here on the thresh hold of a new year, I am filled with that sense of anticipation and excitement tinged with a fear that has the stomach sucked up tight against the backbone that filled those last second before the chute opened for a very long eight second ride. Deadlines and tight schedules loom, but the reward is miles of smiles, and the need for a larger trunk to hold the memories made. Wow, Jim, thank you so much for all the kind words about Afton Station and my blog! You are one of my most loyal advocates, and I appreciate it very much. A question: Your Facebook post mentions a publication date of your new Encyclopedia of Route 66 as October 2012, and it what you say in the post makes me think it's already available. Please let me know.